ZICO is the first ASEAN multidisciplinary services firm to be publicly listed and to have a presence across all 10 ASEAN member countries. Because we have taken our cues from the changing marketplace, our decision to recast the conventional service delivery model into a collaborative ecosystem of professional services was driven by our belief in being able to create added value for our clients. What this means for you, is that we are able to deliver more than just legal solutions; we provide an efficient and cost effective one-stop shop for integrated services. We have disrupted the traditional BigLaw model and combined it with the best of NewLaw and NonLaw influences, making our depth of expertise across a multidisciplinary platform under one ASEAN umbrella our cardinal differentiator. By implementing a uniquely integrated network of services within ASEAN,  we have devised a multidisciplinary structure which enables you to focus on your business needs. Through this model, we provide a comprehensive range of services that can be seamlessly integrated into practical solutions for any complex business requirements along your investment life cycle. Our multidisciplinary platform (MDP) model is supported by a shared service company, housed within a regional brand. 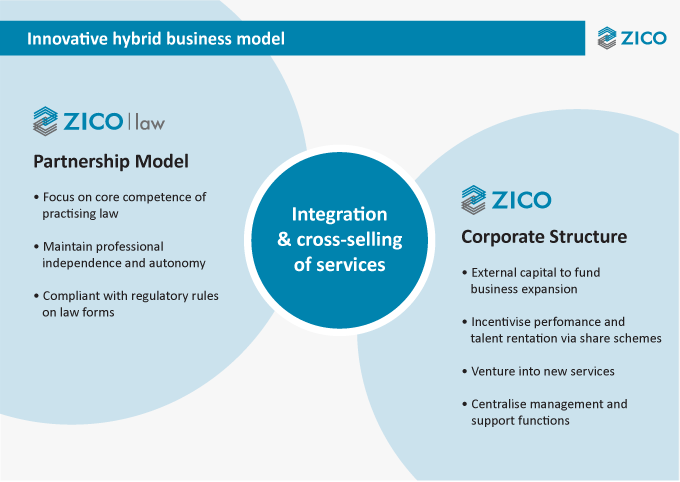 The ZICO brand consists of ZICO Holdings Inc. (www.zicoholdings.com, an ASEAN multidisciplinary professional services firm listed on Catalist of SGX-ST); and ZICO Law, a network of leading local law firms in ASEAN (www.zicolaw.com).